The theme for this week is frosting. I wanted to make a frosting I’ve never made before but I wasn’t sure what that frosting would be. I was inspired when I opened up the refrigerator and saw the blood oranges I had picked up at the grocery store last weekend. Do blood oranges remind anyone else of Dexter or is it just me? While reading internet news and such this morning I discovered it was National Chocolate Cake day… who knew? Seriously though, who comes up with these “national” food days. While the recipe I am sharing today isn’t a chocolate cake, you could use this frosting to decorate your favorite chocolate cake and celebrate this holiday. Blood oranges really don’t differ in flavor than your traditional navel orange, but they do have a beautiful bloody red inside. When making the frosting try to use the juice from oranges that have the reddest insides in order to get that pretty pale pink color. These would be perfect for Valentine’s Day, a bridal shower, or baby shower for a little girl. 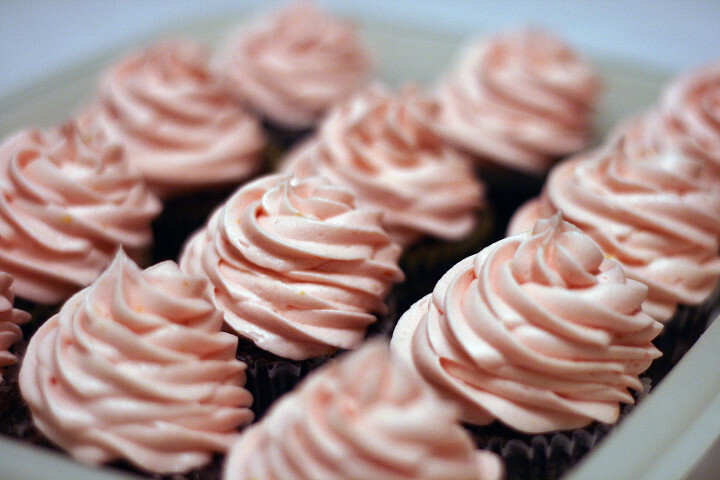 You get a delicate pink colored frosting without the need for red food coloring. Plus the frosting tastes delicious! 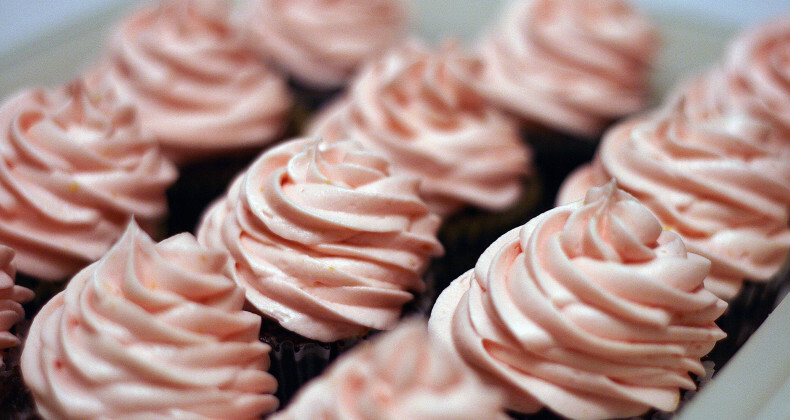 What is your favorite frosting? I think my favorite frosting I made was a dulce de leche buttercream for a friend’s birthday cake. Yum! In a stand mixer beat butter and cream cheese on high for about 5 minutes until complete combined and fluffy. Turn mixer down to low and slowly add in the powdered sugar, being careful to make sure the sugar doesn't fling out of the bowl. As the sugar becomes more incorporated turn the speed up to medium high. Add in the vanilla extract, zest, and blood orange juice. Beat on high until fluffy. If the frosting isn't stiff enough for your liking add more powdered sugar. But make sure to turn your mixer down to low otherwise you will be wearing powdered sugar. Pipe onto your favorite cake or cupcakes. 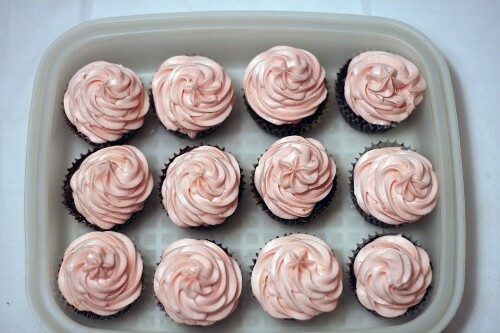 I used a 1M tip and generously swirled the frosting onto gluten free chocolate cupcakes. Soo pretty! Cant believe I missed National Chocolate Cake Day! But then again I was feeling guilty about making and enjoying the cake I made the week prior. Chocolate cake(my mom’s recipe) with my fave frosting….German Chocolate! Loaded with coconut and nuts- and not out of a can! !